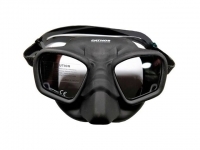 • Free-diving and deep spearfishing mask, with extremely low inner volume and very good visibility. • Ultra soft silicon material. • Packaging: rigid transparent box.